Market Anthropology: A Return to "Normalcy"
For all the anxiety, the "new normal" has performed a lot like the old - or at least the normal we were accustomed to in the back half of the 1990's. Perhaps not quite Livin' La Vida Loca "normal", but when you compare our equity market returns over the past 5 years with the rest of the world - Gisele wasn't the only one to turn her back on the U.S. right before Old Glory caught another strong breeze. All joking aside, we have tremendous respect for Mohammed el-Erian's sharp investing acumen and intuitive market philosophies. To his credit, many of the economic, monetary and fiscal predictions outlined by him in 2009 have held up. Growth has been disappointedly sluggish and unemployment stubbornly high. He was also on the mark initially in anticipating that emerging markets would lead the way in the recovery. Where his and many participants expectations went astray was assuming the shift in economic leadership away from the U.S. and the dollar to developing nations (particularly in Asia) - had room to run. In true contrarian fashion, the concept practically top ticked the balance of the world's outperformance (namely China) in the recovery and a major pivot for the dollar. Today, as conventional market wisdom has firmly embraced the notion that the U.S. under the stewardship of the Fed is the safest neighborhood to park ones capital, the original tenet of outperformance by developing nations - particularly China, is now overgrown with pessimism and stands of contrarian tinder. While we agree it looks rather bleak in the East right now, we know markets have been discounting these conditions for some time. Considering the Fed has written the textbooks for applied monetary intervention, we wouldn't be surprised to see China pull a page or two in the coming months or even write a new chapter of their own. 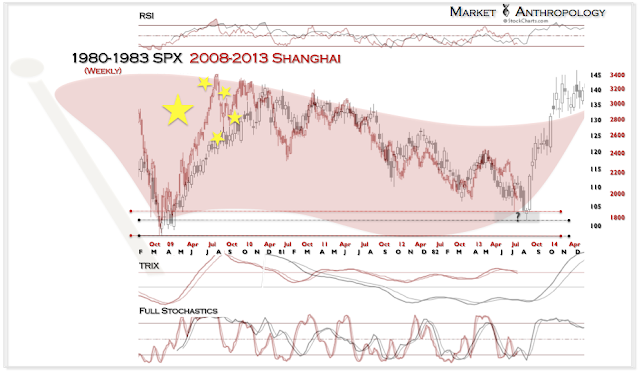 For reference, our Shanghai Composite comparative with the SPX, circa 1982 - may hold some clues.